This pie is amazing. It’s quick, and it’s an original comfort food. I made the wise choice to make it for my very backwoods grandpa, because he loves chocolate. I was worried he would not be a fan, but he loved it and now he requests, DEMANDS it. 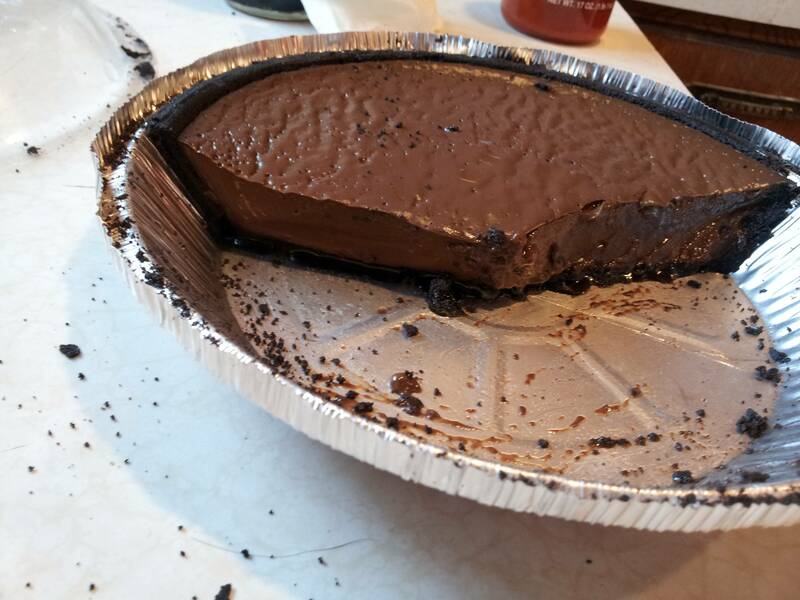 He loves bacon, cheeseburgers, spam, deviled eggs… and this vegan chocolate pie. Preheat the oven to 350 and bake the crust for 10 minutes. In a small (2 quart) sauce pan, combine 1 cup of almond milk and the cornstarch. Use a fork to whisk until the cornstarch is good and dissolved. Whisk in the remaining milk, the sugar, cocoa powder and salt. It’s okay if the cocoa is a bit clumpy at first, it will dissolve. Bring mixture to a boil, whisking occasionally. Keep a close eye because once boiling, you want to lower the heat and bring to a slow rolling boil. Whisk consistently until mixture is thickened, which should be about 7 minutes give or take. Add chocolate chips and mix to melt. Stir in vanilla. Pour the pudding into the prepared pie shell and let cool for about 15 minutes on the counter. To keep a skin from forming, place a circle of parchment paper over the filling. Refrigerate and let set for at least 3 hours, and pull the paper off just before serving. This entry was posted in Recipes and tagged chocolate, pie.